In this collection of vintage blues and jazz you can hear the fun of those rural frolics and feast days. Listen closely and you’ll also hear something else – a new metropolitan America where barbecue became an urban commodity, available any time you had cash in hand. The Great Migration of the early twentieth century carried black and white Southerners from hard luck farms to the big cities of the North and West. Nearly every one of these musicians made that difficult and exciting journey, moving from a world where you were under the landowner’s thumb, to a land of plenty where you could get whatever you desired. Or at least that’s what you boasted, regardless of reality. For indeed these are boasting songs, not all that far removed from today’s hip-hop music. Barbecue was part of an urban lifestyle, a little like the flashy luxury goods that today’s rappers show off. On these old records, barbecue stands in for all that is good – money in your pocket, someone eager for your sexual charms. Oh, and lots of fine food whenever you want it. There is no truth, by the way, to the notion that “barbecue” derives from French words meaning “beard to tail.” A journalist covering politician Andrew Jackson, noting his supporters’ love of whole-hog barbecue, made that pun, which got picked up as gospel truth. “Absurd conjecture,” writes the Oxford English Dictionary. “Flagrantly fatuous Franco-poop,” opines food writer C. Clark “Smoky” Hale. Lots of other ethnic groups contributed to barbecue, creating a uniquely American food. Scholars John Shelton Reed and Dale Volberg Reed document German heritage in North Carolina’s vinegar-and-tomato preparation. The Southern Foodways Alliance’s Barbecue Oral History Project has uncovered Greek heritage in the dry rubs favored in Memphis. Mexicans, who still call their food barbacoa, may have contributed the practice of cooking in a pit in the ground. Pepper sauces seem to have come from Africa, and it was often black men who put in the hard, long hours required to tend barbecue’s distinctive slow cooking. When Brownie McGhee recorded those lines, he was in New York City, far from his native turf. Over five million African-Americans left the South during the first half of the 20th century seeking urban opportunity beyond the Mason Dixon Line. More than twice that number of whites made the same journey. Even if they didn’t depart Dixie, farm folk moved to the booming cities of the South. Barbecue moved along with them. “A lot of the barbecue sold by African-Americans was done out of their homes or using makeshift cookers on the corners of black neighborhoods – finding the capital to open a place was hard to come by,” says Georgia barbecue historian Dr. Craig Pascoe. Even so, the food proved irresistible, and it wasn’t unusual for whites to make stealthy visits to black-owned barbecue stands for a delicious take-out dinner. It wasn’t good to look too newfangled, though. 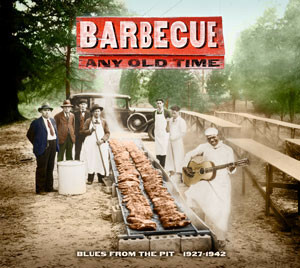 Big city eaters hungered to connect with “country,” with “tradition.” Even as Tidwell’s Barbecue attracted motorcar patrons to its suburban Atlanta location in the late 1920s, its promoters took care to showcase pitmaster Bob Hicks, a down-home blues guitarist. As “Barbecue Bob” he became the symbol of the restaurant – and a major national recording artist. Corn beef hash and kidney stew.